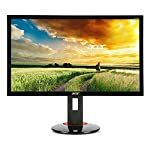 The PG27AQ is an ultra high definition (or sometimes called 4k) monitor capable of displaying a stunning 3840 x 2160 pixels on screen at once. This gives a stunning images for games and also provides plenty of screen space for productivity should you be able to tear yourself away from the latest Doom release. There is a downside to high res monitors, right now you’re going to need one powerful PC to get good frame rates whilst running games at high detail settings. Maintaining a steady 60 frames per seconds at ultra HD resolution is going to need some serious GPU power, even the new GTX1080 cards can’t manage it. That said, if you are reading this review in a few years time then I hope even entry level cards will be able to manage 4k, and as monitors tend to be the longest lasting piece of hardware I see no harm in planning ahead and going for one of these even if you can’t run it yet. Remember, PC games are very good at allowing you to drop graphical details to increase frame rates or you can run at lower resolutions. The ASUS PG27AQ also includes G-Sync which will ensure your games appear smooth even when you do drop below the maximum frame rate. This monitor has got the gamer in mind. The PG27AQ seems to have a fairly aggressive “gamer” style with angled lines on the base and stand. This may or may not be to your taste but it certainly looks sleek, however this kind of look is arguably out of place in a home office but might look more appropriate in a teenage bedroom. It also features a rather menacing red glow from strategically placed LEDs (which can be switched off!). 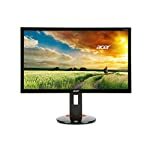 The monitor features a very thin matt black plastic bezel which easily fades into the background once the monitor is switched on. The stand has the full range of adjustments, you can even swing into portrait mode if that’s helpful to your gaming need (probably not). 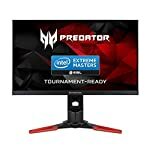 The ASUS PG27AQ has a maximum refresh rate of 60hz, so if you are looking for high frame rates you won’t be able to get that here. But given the resolution of this monitor you’re not going to have the bandwidth to send 144 frames per second to the screen anyway. G-Sync compatibility is provided though and this will make your games run more smoothly when activated. Note that it can’t work miracles, when your frame rate drops it will help smooth out the experience but a low frame rate is never going to be as good as a solid 60 frames per second. You’re going to need a fast graphics card to get the best out of a UHD monitor. You should also be aware that without scaling your Windows desktop is going to look very small on a 27″ 4K screen. Professional reviews have found favourable input lag and pixel responsiveness to ensure blur free pictures and responsive gaming. The colour reproduction is also as expected for an IPS based panel, in other words, solid. We give the ASUS PG27AQ a 3.5 out of 5 rating. Want to know what existing owners of the monitor think? You can read real user reviews here. 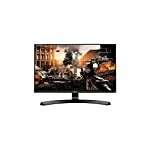 Should I buy the ASUS PG27AQ? The ASUS PG27AQ is a 27" ultra high def monitor for those with systems powerful enough to run at this high resolution. It's not cheap but if your PC has the components required you're probably the type of gamer who doesn't mind spending. However, such a discerning gamer might be looking for a refresh rate higher than 60hz. If you are having some doubts about this purchase then why not read some real owner reviews and see what other buyers think. Welcome to the ASUS PG27AQ FAQ. This section attempts to answer common questions you may have, please get in touch if you have any more queries or if you think our answers need updating. Can I mount this on a different stand? 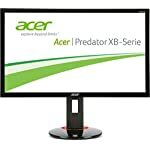 Yes this monitor does feature standard 100 x 100mm VESA fixings.